Waste reduction at D-CHN goes beyond recycling scrap aluminum; conserving and reclaiming liquids are also part of the program. D-CHN uses large volumes of sulfuric acid, phosphoric acid, and sodium hydroxide in its anodizing process. It did not take management long to realize that a reduction in chemical usage directly translated into big savings in raw material and disposal costs. How does D-CHN recycle phosphoric acid? In anodizing, aluminum is immersed in a brightening solution of phosphoric. Some of the aluminum dissolves into phosphoric solution. When the concentration of dissolved aluminum builds to a certain level, the solution becomes contaminated and must be replaced. 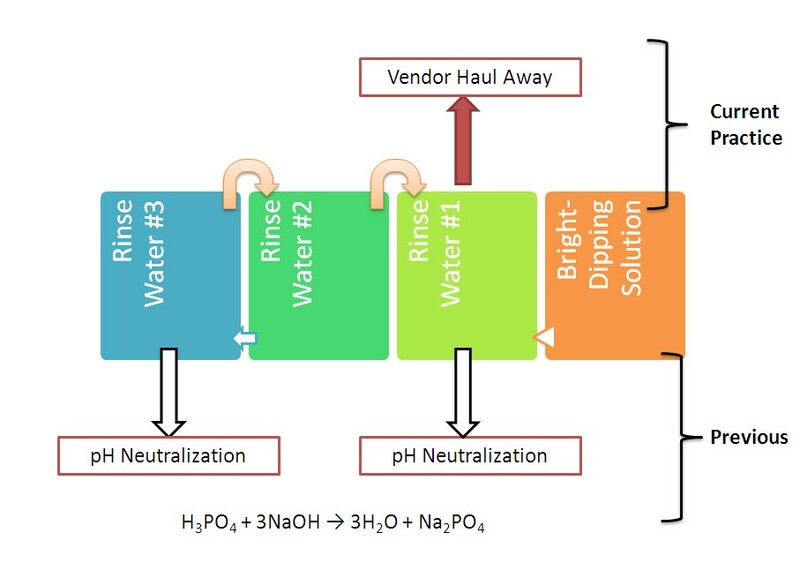 In D-CHN one single stage hot rinse and two counter-current water tanks connected to pH neutralization unit were used to rinse bright- dipping aluminum part prior to anodizing as shown in diagram below. In order to neutralize phosphoric rinse water, 1.3 gallon of 50% sodium hydroxide (NaOH) consumes each 1.0 gallon of 85% phosphoric acid. D-CHN devised a method to rejuvenate the three rinse waters. First, all three rinse waters were made as dead rinse waters. By doing this, rinse water #1 thru #3 starts to accumulate phosphoric acid content in the rinse. We learned that about 10 – 12 days take to reach phosphoric acid level at 58 – 60 weight percent at rinse water #1. Second, D-CHN pumps out the rinse water #1 to vendor who sold to a customer of 60 wt% of phosphoric acid for their sanitized application. D-CHN has shipped rinse water #1 to the vendor every 10 – 12 days per cycle. This two-step process recycles 7,200 gallon of phosphoric acid (60%), reduces 3,000 gallon of sodium hydroxide (50%) usage, and saves $8,000 D-CHN each year in purchase of sodium hydroxide chemical. Sulfuric acid is inexpensive, but neutralization of the acidic waste is quite expensive. D-CHN is also planning to install diffusion dialysis system to recycle sulfuric acid near future. This entry was posted in Company Activities. Bookmark the permalink.